As a dense and developed country full of skyscrapers and shopping malls lining the city, it can be difficult to find the perfect spot for your pre-wedding shoots. Choosing a pre-wedding shoot can be just as hard as deciding where the wedding ceremony will be held. Of course, you can fly elsewhere to popular romantic destinations with gorgeous backdrops and views but why break the bank when Singapore actually has secret photography spots that are not only enchanting, but also romantic. If your type of pre-wedding photography includes the sea, sand, landscape and the sun in a serene, private spot, here’s our ultimate guide for secret photography spots you never knew existed! These secret photography spots are definitely great for lovers of lush greenery and sandy beaches. Image credit: The Analog Co. Since its official opening last year, Coney Island has attracted avid photographers to the island. The woodlands in Coney Island give a sort of magical feel with its signature Casuarina trees. There are also plenty of dirt tracks to achieve the country road feel, or even a shot of the sea as backdrop. Be there early to beat the crowd! Tip: Bring plenty of insect repellant as there are mosquitoes and sandflies around. Known as one of Singapore’s last unspoilt beaches, Lazarus Island has grown in popularity with young Singaporeans eager for a quiet hideaway far from the crowd. Easy to reach with a 15 minutes boat ride from Marina South Pier, this is the place to get your beach photoshoots. Do note that this place may be a little troublesome as there are no toilets or shelters available on the island. Missed Punggol’s ‘Instagram tree’? Fret not, you can find another version nestled at Upper Seletar Reservoir. The vast open spaces, often silhouetted against the backdrop of a pastel-hued sunset and gorgeous body of water make this lesser-known location great for nature-inspired photos. Another pretty spot to take around Upper Seletar Reservoir is the jetty to the left of the tree along the reservoir. If you’re a fan of rivers, lakes and oceans, Upper Pierce Reservoir Park makes a wonderful pre-wedding shoot location. With its vast body of water, beautiful forest and serene environment, you’ll feel like you’re in another country. This reservoir is a great location for sunset wedding shoots or a morning sunrise shoot. With its large open spaces allowing room for creativity, get your props ready for a fun shoot. Unknown to many, this hidden gem in the deserted South-West of Singapore offers a vast vacant field where lalang grows aplenty. The setting is gorgeous for warm, summery photos where you need not worry about pesky onlookers. With such a quiet, private and peaceful location, this is a great spot for a magical and romantic shoot. The best time to visit the lalang fields is definitely during the evening as the setting sun provides a soft touch to images with warmth and nostalgia. Although the lalang fields in Punggol are longer, and the lalangs taller, than the ones in Tuas, they are similar looking, with the exact same type of grass. The abandoned railway track is a popular photo-taking spot for many couples. There is a rugged, nostalgic, vintage feel to the iconic cast iron bridge. Apart from the track, the train station and rusted overarching structures provide a photogenic backdrop. Besides the railway tracks at Sunset Way, there are also alternatives at Tanjong Pagar and Bukit Timah (along Rifle Range Road). Do take extra care when venturing onto any abandoned tracks as you’ll have to climb hilly terrains and walk between the planks on the track. This may be a tedious location to get to, but you’ll get to capture lovely photos. Not just the perfect place for plane spotting, Changi Boardwalk is also a lovely spot surrounded by natural beauty. This spot has heaps of natural landscapes for photographers to work with and is also popular for its vast sunset sky. The combination of water, wood, stones and trees evoke a poetic and serene feel. With such secret photography spots in Singapore, why settle for indoor studio shoots? 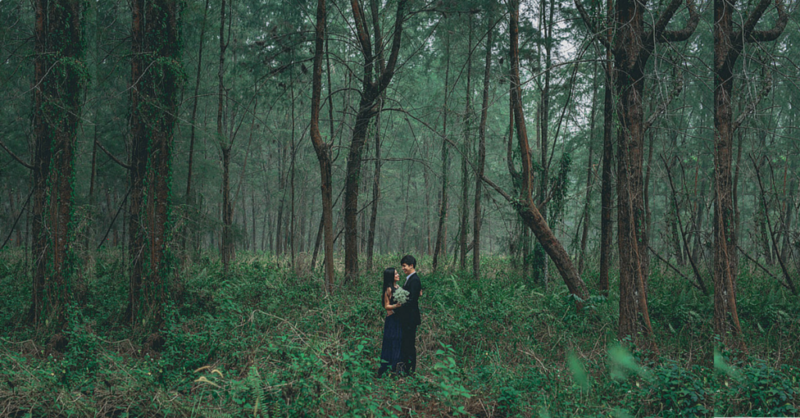 Venture out and capture your pre-wedding shots with nature as your backdrop. Tip: do plan your day in advance, scout the area first, schedule your photographer and make-up artist, and prepare your props! Also read: 5 Spots in SG To Catch The Sunrise Of Your Lifetime!